Scientists at the University of Georgia Skidaway Institute of Oceanography participated in Ocean Sampling Day—an ambitious, international project to produce a single-day snapshot of microbial populations around the world. On Saturday, June 21, researchers collected water samples at 185 global sites, ranging from Antarctica to the Arctic Ocean and from New Zealand to Iceland. This was the first global, simultaneous sampling of microbes in ocean, coastal and Great Lakes waters. The sampling program will support international missions to provide information on the diversity of microbes, their functions and their potential economic benefits. Skidaway Institute scientists collected water at two locations. One team collected and processed samples from the Skidaway River, which is immediately adjacent to the Skidaway Institute campus. This activity will also be part of an ongoing water-quality monitoring program that Skidaway Institute has supported for more than 25 years. A second group teamed up with scientists from NOAA’s Gray’s Reef National Marine Sanctuary and collected samples from Gray’s Reef. The 14,000-acre marine sanctuary is located approximately 17 miles off the coast of Georgia’s Sapelo Island. 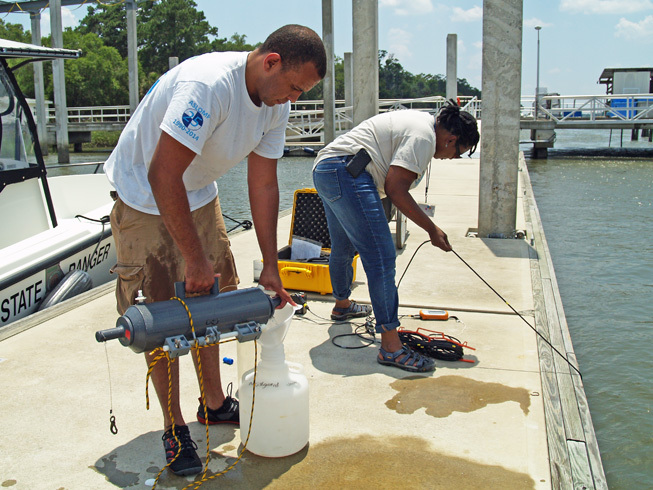 Kevin McKenzie and Tina Walters collect samples from the Skidaway Institute dock in the Skidaway River. Scientists at all the sites used the same protocol to collect and process their samples. The samples will be analyzed at Jacobs University in Bremen, Germany. However, shipping liters of water would be both impractical and expensive. So the Skidaway Institute collection team of Tina Walters, Kevin McKenzie and LaGina Frazier ran the water through filters fine enough to collect the microbes and other particulates in the water. The filters, which are about the size of a lipstick tube, were then frozen to minus 80 degrees Celsius and shipped to Germany where they will be analyzed. According to Frischer, the Ocean Sampling Day project will advance scientists’ understanding of the diversity and role of microbes in aquatic environments. Microbes, such as viruses, bacteria, algae, fungi and microzooplankton, account for the majority of biomass and genetic diversity of life on Earth and they play critical roles in all living systems. The Ocean Sampling Day project was coordinated jointly by Jacobs University and the University of Oxford, U.K. The effort was launched under the umbrella of the European-funded project Micro B3, which aims to boost marine research and innovation opportunities. Additional information on the global Ocean Sampling Day project is available at http://www.microb3.eu/osd.